Are you still worried about your weight? Do you want to lose weight reasonably? Do you want to measure your weight every day? 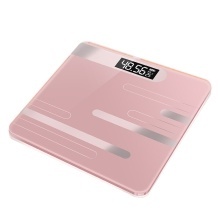 Then this high precision and practical weight scale will satisfy you, it is easy to use and operate. High-strength tempered glass panel, strong and practical, resistant to cracks, strong safety performance. With temperature display function, it can also sense temperature changes while weighing, and sense indoor temperature changes for 24 hours. HD LCD screen, automatic adjustment, clear readings day and night. Immediate auto power on as soon as you step on the scale, auto power off in 8-15 seconds as soon as you step off the scale. Equipped with four high-precision sensors, instantly capturing subtle changes. Jin and kilogram can be switched, more convenient and clearer to use.